← Do you want a say in how KX is designed and planned? 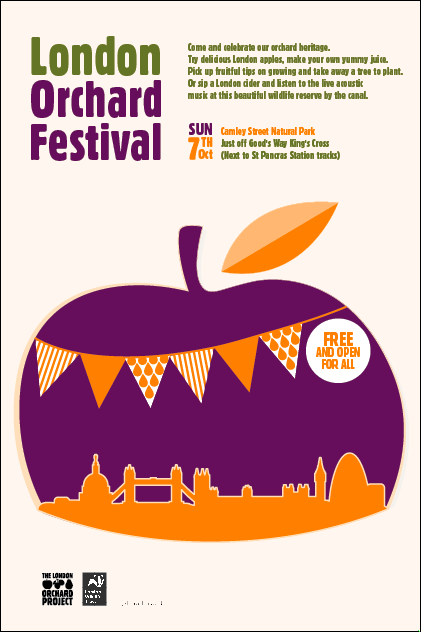 The London Orchard Festival takes place Sunday week in the green heart of King’s Cross – Camley Street Natural Park. “Ever sampled a Merton Wonder apple, made your own apple juice or wondered what the nearest orchard in London to you is? Find out at The London Orchard festival. “The event forms part of Common Ground’s Apple Day festivities to celebrate apples, orchards and local distinctiveness. “Green-fingered Londoners can pick up fruitful tips on how to grow the perfect apples and take away a tree to plant. There will also be an exhibition of fruit that has been harvested throughout the capital by volunteers, juice pressing (bring your fruit and an empty bottle), a juice bar with a homemade pedal-powered fruit crusher, food baked in a rustic clay oven, a cider making and tasting stall run by the Campaign For Real Ale, games and activities for children, live acoustic music from Light Falls Forward andurban fruit folklore with Jonathan Huet of Walking with Trees. Free event. Sunday 7 October 2012, 10.30am to 7pm at London Wildlife Trust’s Camley Street Natural Park. This entry was posted in Arts and Entertainment, Community groups, Food and Drink, Noticeboard, Wildlife and Nature, Young People and tagged apple pressing, apples, autumn, Camley Street, cider, Gardening, harvest, London Orchard Project, London Wildlife Trust, orchards, urban gardening. Bookmark the permalink.